Derby County lost further ground on the Championship promotion spots as Birmingham City inflicted their heaviest defeat of the season. The Rams had the better of the first half, but were frustrated by Gary Rowett's well-organised visitors. Blues turned the tables after the break when Paul Robinson headed his side in front from Jacques Maghoma's corner. Stephen Gleeson's cross then sailed in before Maikel Kieftenbeld's volley capped City's first away win in six. Blues move to within two points of the play-off places, while defeat extends the Rams' winless league run to four games. Derby boss Paul Clement had questioned his side's promotion credentials after their midweek draw with Reading and his players responded, Bradley Johnson flashing a long-range shot just wide, and Jeff Hendrick going close with a header when teed up by Stephen Warnock's teasing cross. But they were stifled by a hard-working Birmingham side, well organised by former Rams defender Rowett. Derby, who have now failed to keep a home clean sheet against Blues in 17 meetings over almost 38 years, started the second half slowly as City pushed forward. Maghoma had a shot blocked when well-placed, then Jon Toral's curling effort was pushed onto the bar by keeper Lee Grant before Robinson pounced from the resulting corner. The stunned Rams could not recover, slipping four points adrift of second-placed Hull City as Gleeson and Kieftenbeld took Blues' run to 10 points out of a possible 12 since Boxing Day. "I was very angry and frustrated after the game against Reading but I'm more disappointed today. I'm disappointed we didn't get the reaction and performance we needed. "We are a good side in a bad period. Confidence is everything - it can go as quickly as it can come back. "But I've full confidence in the players that we will get through this. I don't think it's abnormal that a team will go through a difficult period in a long season." "When you look at the week Derby have had, and the two or three-week period they've had, you could sense maybe a little bit of nervousness and vulnerability around the place. "In that second half, with a bit more drive about us and playing five more yards up the pitch, it made a huge difference." Match ends, Derby County 0, Birmingham City 3. Second Half ends, Derby County 0, Birmingham City 3. Lee Grant (Derby County) wins a free kick in the defensive half. Attempt saved. Jacques Maghoma (Birmingham City) right footed shot from outside the box is saved in the bottom left corner. Clayton Donaldson (Birmingham City) wins a free kick in the defensive half. Substitution, Birmingham City. James Vaughan replaces David Davis because of an injury. Substitution, Birmingham City. William Buckley replaces Jon-Miquel Toral. Corner, Derby County. Conceded by Paul Caddis. Attempt blocked. Nick Blackman (Derby County) header from the centre of the box is blocked. Attempt blocked. Abdoul Camara (Derby County) left footed shot from the left side of the box is blocked. Corner, Derby County. Conceded by Paul Robinson. Attempt blocked. Jacob Butterfield (Derby County) right footed shot from the right side of the box is blocked. Assisted by Nick Blackman. Attempt blocked. Nick Blackman (Derby County) left footed shot from the left side of the box is blocked. Assisted by Chris Martin with a headed pass. Attempt saved. Bradley Johnson (Derby County) header from the centre of the box is saved in the top left corner. Assisted by Abdoul Camara with a cross. Goal! Derby County 0, Birmingham City 3. Maikel Kieftenbeld (Birmingham City) right footed shot from outside the box to the top right corner. Nick Blackman (Derby County) is shown the yellow card for hand ball. Hand ball by Nick Blackman (Derby County). Attempt missed. Jon-Miquel Toral (Birmingham City) left footed shot from the left side of the box is high and wide to the right. Attempt blocked. David Davis (Birmingham City) right footed shot from outside the box is blocked. Assisted by Jon-Miquel Toral. Attempt saved. Nick Blackman (Derby County) left footed shot from the centre of the box is saved in the centre of the goal. Assisted by Chris Martin. Stephen Gleeson (Birmingham City) is shown the yellow card for excessive celebration. Goal! 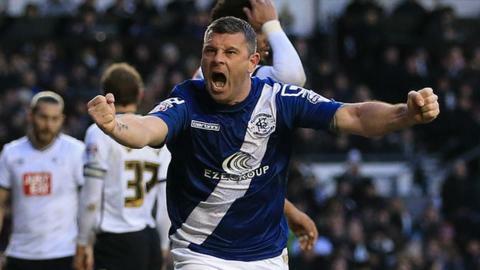 Derby County 0, Birmingham City 2. Stephen Gleeson (Birmingham City) right footed shot from long range on the right to the top left corner. Assisted by David Davis.